This week’s coverage brought to you by Freedom Cycle. Be sure to check them out in Halifax or online! After missing the event last summer, I was sure to make the trip out to River Glade MX in Moncton, NB for round 8 of the Rockstar Energy MX Nationals this year. Although numbers were down for the Pro motos Sunday (34 MX2 / 29 MX1), the atmosphere and the crowd still make this one of the best rounds of the series. Here’s a look at some of the racing action from this past Sunday. One of the cool things at the mid-summer races is the cool new gear riders display. #444 Dustin Creson, #762 Blake Savage, and #14 Shawn Maffenbeier do everything they can to keep #1 Kaven Benoit from getting out front early. It didn’t work for long. #257 is past Walton TransCan Alpinestars Bronze Boot winner, Taylor Arsenault. He grabbed a 20th in the first MX2 moto but then his 2nd moto DNF put him back in 26th. #26 Michael Da Silva was the only rider to race both classes (that I noticed) Sunday in Moncton. MX2: 15-DNF 23. MX1: 13-20 15. #51 Brock Leitner has had a summer to forget. After coming back from an ankle injury, he is now out with a broken collarbone. He had a good first moto in 14th. Good luck with the rehab, Brock. #111 Alex Jeffery looked pretty ‘fly’ in his 2016 gear. He was top Intermediate last week but missed it this week. He brushed off a bit of a dust up Saturday and finished 17-19 after coming around the first lap in last place in the second for 19th. Top Intermediate honours went to local rider, #315 Jordan Melanson, with 19-13 motos for 13th. #9 Morgan Burger had a great first moto battle with #620 Brad Nauditt and took 6th place. He was up in the top 10 in the second but crashed with #34 Westen Wrozyna and took quite a while to get going again. 6-22 gave him 12th. Here’s that fall. #34 Wrozyna got up quickly and went on for 24-11 motos and 16th overall. His trip into ‘Devil’s Ditch’ (Thanks, John Bourgeois for coining that.) drew all the attention Sunday. His 5-17 gave him 11th. #444 Dustin Creson says he’s definitely not a sand rider so he was happy at River Glade. 12-9 gave him 10th. #10 Nathan Bles was finally back in action after his arm injury. He rode the KTM 250 2-stroke in the MX2 class and finished an impressive 9-10 for 9th overall in his race back. Remember, he ran 3rd place in MX1 until the final lap last year in Ulverton. #803 Marcus Nilsen had a nice battle with #39 Jess Pettis in the second moto. His 11-8 motos put him in 8th. #39 Jess Pettis is full of confidence lately and it’s showing. His 10-7 motos gave him 7th. #620 Brad Nauditt had a consistent day with 7-6 motos for 6th. #105 Jimmy Decotis was up in the mix early in the first but then had some troubles on lap 4 and dropped back and was in a great battle with Bles and Pettis. 8-4 gave him 5th. #134 Cole Martinez is back up to speed where he belongs. He led the first moto on lap one and then his 4-5 motos put him in 4th. #14 Shawn Maffenbeier is finally feeling 100% and it’s showing. He’ll win one before the season is over. 2-3 gave him 3rd. The battle at the front of the pack was a good one Sunday. #21 Jeremy Medaglia swapped spots with Maffenbeier and his 3-2 gave him second. #1 Kaven Benoit finally missed a holeshot and has his first eastern round blemish on his record. He had to work for the win in the first moto but managed to get to the front. It’s going to be tough to stop Benoit with 2 rounds remaining, he’s just so hot right now. 1-1 for another W.
Maffenbeier getting called onto the stage. Medaglia acknowledges the big crowd. MX2 Podium: Kaven Benoit (1-1), Jeremy Medaglia (3-2), Shawn Maffenbeier (2-3). #42 Riley Brough had some tough luck in the first moto with this chain issue. He brushed it off and came back for 17th in the 2nd for 23rd. #7 Bobby Kiniry proved he is tough as nails again Sunday. After going down hard and making a mess of his jaw, he got himself gauzed up and duct taped for the second. He managed to finish 15th for 22nd overall. #7 Bobby Kiniry getting attended to after his hard crash halfway through the first moto. #36 Hayden Halstead had a solid 1st moto with a 14th but then a flat front tire forced a DNF for 21st. #35 Matthew Davenport had a great first moto, taking 9th even after his goggle lens was blown out and his eyes were a mess. Unfortunately, as he was heading for another top 10 moto, his motor let go causing a DNF. 17th overall. #123 Brett Metcalfe had another rough day. 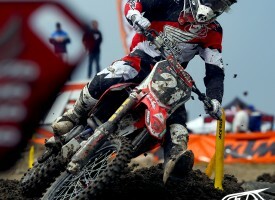 In the first moto, he was up in 3rd early but then had moto troubles after the finish line and took a DNF. On the back-up bike for the 2nd, he was in a tight battle the entire moto and took 5th for 14th overall. #23 Dylan Schmoke had a good week finishing 11-16 for 13th. Watch for a video spotlighting his River Glade day soon here on the site. #43 Jay Burke had a good day and was up in the mix in both motos, battling Schmoke here and #46 Michael Fowler and #36 Halstead.. His 15-11 motos put him in 12th. #33 Shawn Robinson had a great first moto way up in 7th spot and was in a tight battle with Davenport and #53 Davey Fraser. His 7-14 put him 9th. #72 Drew Roberts had an amazing day in Moncton! He finished a very solid 10-10 for 8th overall. #24 Kyle Swanson continues to improve each week on his new ride. His 8-8 motos gave him 7th. Local boy, #53 Davey Fraser, promised another fist pump if he grabbed a holeshot. He may not have accomplished that but his 6-9 motos for 6th overall gave the Moncton crowd something to cheer about. #761 Cade Clason was happier on solid ground too. He proved he has the speed to battle for podiums with 4-6 motos for 5th. #3 Tyler Medaglia had the locals cheering loudly too. His 3-4 motos gave him 4th and the Brian House Memorial as top-finishing Atlantic Canada rider. Tyler accepting his 10th anniversary Brian House Memorial. #101 Matt Goerke needed more tear offs than normal after his chain came off on lap 1 of the first moto putting him charging from last place. He made it up to 5th place and then came back to win the 2nd for 3rd overall. He retains the red plate as points leader. #148 Cole Thompson has place in River Glade folklore for his trip into ‘Thompson Pond’ back in 2013, so the pressure was on. Thompson got into the lead but then stalled the bike and handed the lead to a charging #1 Colton Facciotti. It doesn’t look as frantic with electric start, does it? #1 Colton Facciotti took his first overall of the season with 1-2 motos. His battle with Thompson was one for the ages. They were this close most of the moto. Colton getting his TV face time. MX1 Podium: Colton Facciotti (1-2), Cole Thompson (2-3), Matt Goerke (5-1).